Is this the Windows-toting answer to a Mac Mini? This mini desktop won't tear through intensive tasks, but for the price, the specs packed into this stylish package make it an attractive option. Ever since Asus launched the desktop answer to netbooks in the form of the EeeBox PC, the market for small-footprint PCs has grown to offer a wide range of options. 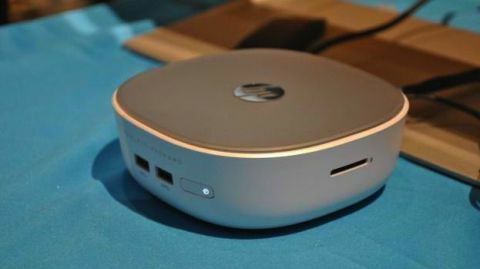 The HP Pavilion Mini 300-030na is one of the latest small, quiet and energy-efficient desktops to come to market, and it's one of the nicest-looking mini PCs we've seen since the launch of the Apple Mac Mini. With models starting at £249.99 ($269, AU$349) the Pavilion Mini is a competitively priced option, with ample storage space and enough power for day-to-day tasks. The model we reviewed came complete with 1TB of storage space, a 1.9GHz Intel Core i3 processor and 4GB of RAM (which can be upgraded to 16GB if needed); a faster i5 model is available, as is a lower-priced option with a less capable Pentium 3558U processor and smaller 500GB hard drive. Although the graphics may not be up to the task of heavy-duty video-editing or gaming, the Pavilion Mini offers plenty of connectivity for such a small package, making it an ideal proposition for light users at home or in the office. Weighing only a little over 660g (1.45lbs) and with a diminutive footprint of 144mm x 144mm x 52mm (W x D x H), the HP Pavilion Mini takes up less desk space than the Apple Mac Mini (although it's slightly taller), and slightly more than the Acer Revo One R85L (which is nearly three times as tall); if you didn't know better you could easily confuse the Pavilion Mini for an external hard drive or Wi-Fi router. Styling is reminiscent of an early 2000s Apple iMac, favouring the combination of shiny white and semi-translucent plastics over utilitarian aluminium bodies you'll find on so many other Mac clones. With miniature proportions and not a square corner in sight, the Pavilion Mini is a cute little machine that would grace even the coolest of workspaces. Up front there are twin USB 3.0 sockets alongside the power button, while on the right there's a handy SD card slot for easy photo access. On the rear there are two more USB 3.0 ports alongside a HDMI, DisplayPort, RJ45 Network, 3.5mm combined headphone/microphone and DC power sockets. The underside is covered in a rubber pad which stops the Pavilion Mini sliding around, which can be removed to enable access to the screws you'll need to undo in order to access the internals.